Our 4 Bar Hand Soap Sampler for the knitter with dry hands contains four slices of our Shea and Cocoa Butter Hand Repair soap fragrances including Herbal, Jasmine, Green Tea and Lavender. Minimum weight is 6.0 ounces or two full size bars. 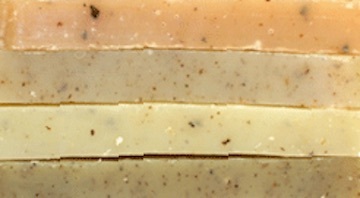 Soaps in this Sampler include Olive, Coconut, Castor and Palm Oils, Shea Butter, Cocoa Butter, Sodium Hydroxide (Lye), Mountain Spring Water, ground medicinal herbs, fragrances and essential oils.